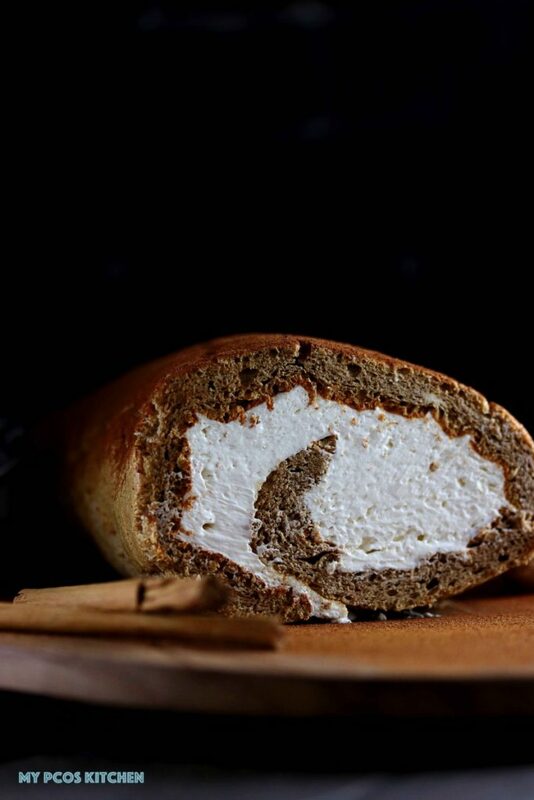 An amazing Gluten Free Gingerbread Cake Roll with a delicious sponge, filled with an easy cream cheese icing. 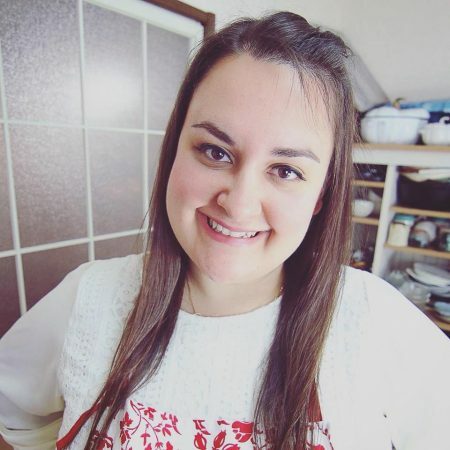 Christmas is coming in a couple of weeks and I wanted to upload a delightful Gluten Free Gingerbread Cake Roll that would be keto and sugar-free! My goal with this recipe was to make a cake roll that was extremely fluffy and light, that was somewhat dark in colour, and tasted amazing! Today’s recipe was a little tricky to make. This past week I made the sponge a total of six times before finally succeeding making this fluffy and spongy one. My 4 first versions all used erythritol as the sweetener and they ALL cracked no matter what I did. I tried powdered erythritol and granulated erythritol, increased and decreased the amount of eggs and almond flour I used, but to no avail. Every single time I used erythritol to sweeten the cake, it would crack and completely fall apart when cooled. The last two versions I made, well I completely gave up on erythritol and used stevia instead. They finally didn’t crack! 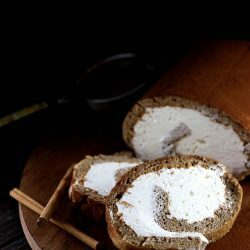 My fifth version didn’t use any whey protein or cream cheese, but it wasn’t as fluffy as my 6th, which is why I decided to stick with this recipe here. 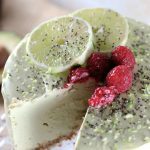 The Low Carb Christmas Roll Cake that I made last year was also sweetened with stevia which is why I had never experienced a fail using erythritol before. 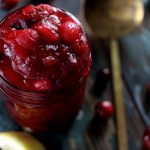 I’d love to know your experiences with erythritol! Have your cake rolls ever cracked with it? This gluten free gingerbread cake roll was proving to be quite the hardship! My 3rd and 5th version used the exact same ingredients, but I swapped the erythritol for stevia. I don’t know why it wasn’t working with erythritol. I would roll up the cake in a towel and it would literally fall apart in the towel, break apart when unrolled, or break into a million pieces when touched. Maybe the brand of erythritol I used was bad, but for this recipe erythritol just did not work. 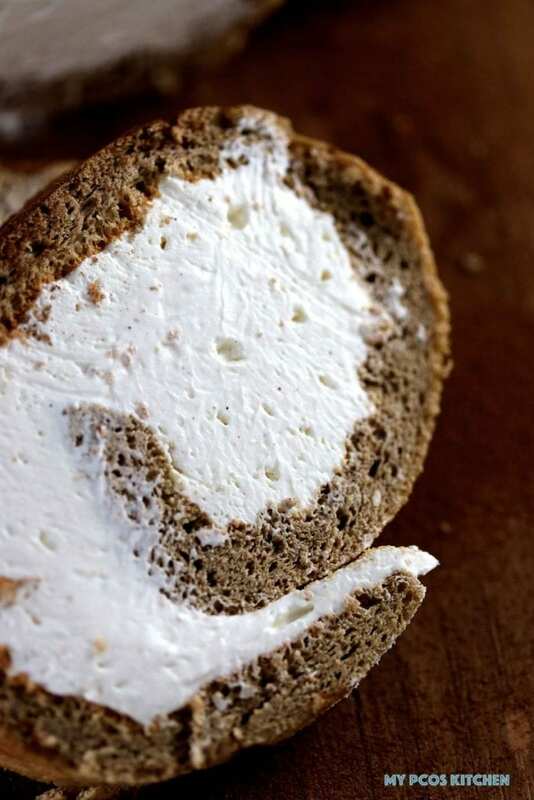 Finally, my cream cheese and whey protein version worked and was wonderful! 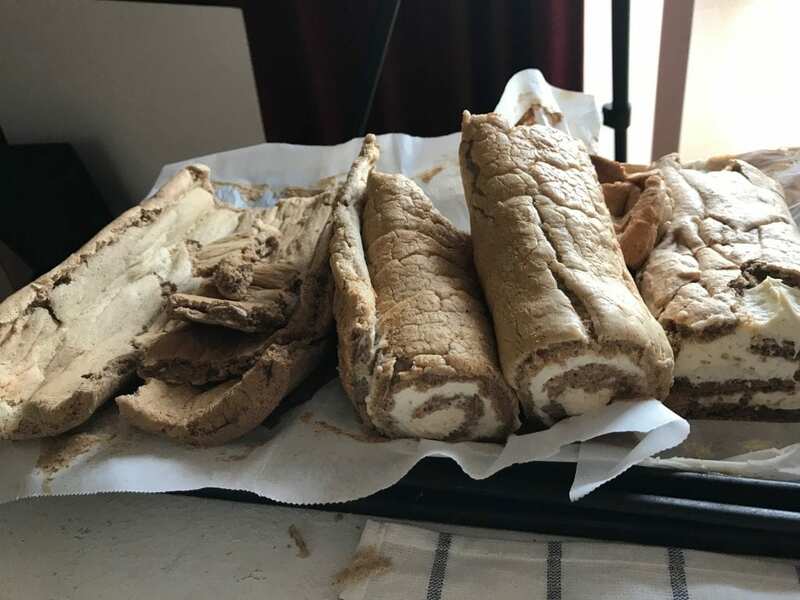 I’m happy that I was able to succeed in making my Christmas roll cake because that way I was able to show everyone how to make a gingerbread cake roll without gluten or sugar! 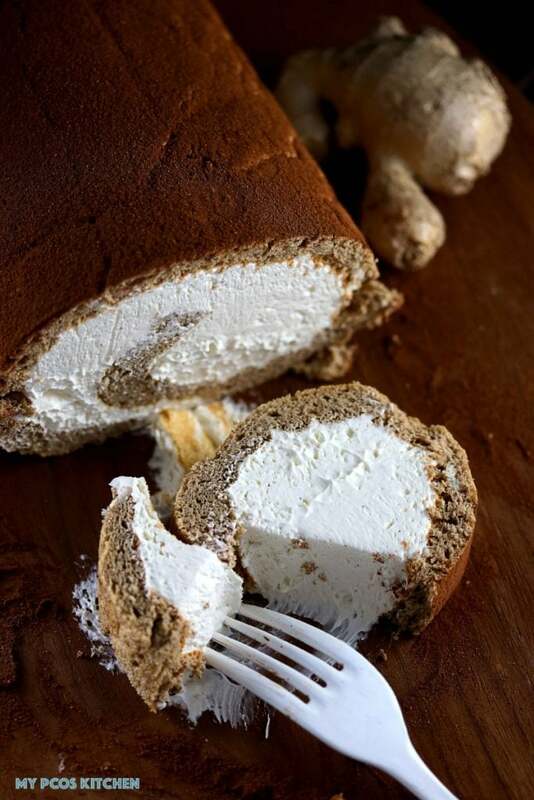 For the cream cheese filling, I wasn’t sure whether to do a simple whipped cream or add cream cheese. I decided to go for a cream cheese one because I was craving something cheesy. I added some heavy cream to it and it was the perfect frosting! 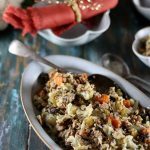 I’ll be making this Christmas roll cake along with my Paleo Tourtiere and a Mushroom-Stuffed Roast Chicken this Christmas because those two recipes for me are what a Christmas dinner should look like! 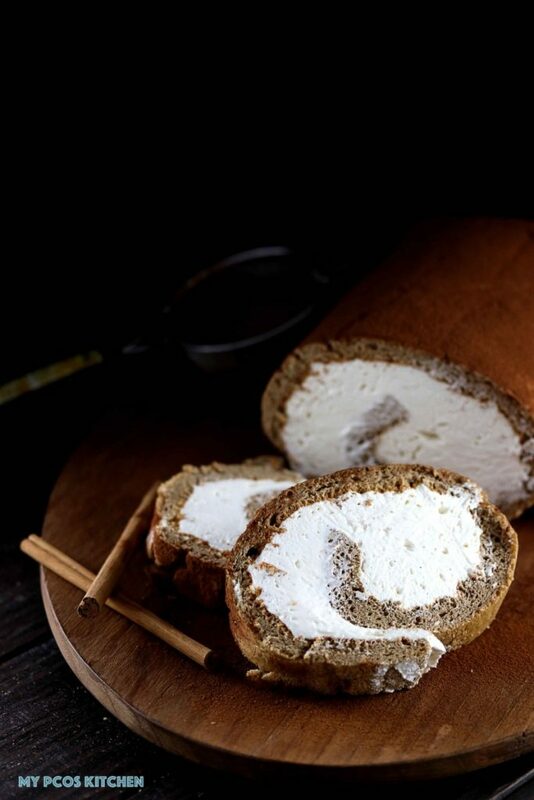 A delicious gluten-free and sugar-free cake roll filled with a cream cheese whipping cream! In a large bowl, add the egg whites and cream of tartar. Whip using a stand mixer or hand mixer until stiff peaks form. In another large bowl, add the rest of the ingredients. Mix with a whisk. The batter will be pretty thick. Add 1/6 of the meringue to the egg yolk batter and mix with a hand mixer until the batter starts to be thinner. Add another 1/6 and mix with the hand mixer again. At this stage, add 1/6 of the meringue at a time, but fold it in with a silicone spatula. Make sure you don't over mix or you'll break the air bubbles and have a flatter cake. Add a piece of parchment paper over a baking pan. Spread the batter evenly onto the prepared baking pan and bake for 13 minutes, until the top springs back when touched. Remove the pan from the oven and let cool for a minute. Put a kitchen towel to the side and lift up the parchment paper and flip on its other side onto the kitchen towel. The parchment paper side should now be side up. Carefully peel away the parchment paper from the sponge cake. Place the parchment paper over again and gently roll up inside the kitchen towel while still warm. We want the cake to cool down in its rolled up form to prevent cracking. Add the cream cheese and 1/2 cup of heavy cream to a mixing bowl. Mix with a hand mixer until smooth and creamy. Add the stevia powder and vanilla and continue to mix. Slowly add the heavy cream 1/4 cup at a time to the bowl and whip for 3-5 minutes with a hand mixer until it starts to thicken. Once thickened, your roll cake is ready to be filled. Carefully unroll the cake and peel off the parchment paper. Spread the cream cheese whipping cream all over evenly. Roll the cake up once more and it's done! You can cut off the edges if you want a clean cut and you can also refrigerate before serving so that it's nice and cool! Sprinkle some of the cinnamon powder over and it's ready to serve! I have tried making it without the whey protein isolate powder, it works but it turned out a bit flatter than the final version. Have you tried it with monk fruit sweetener? Stevia or monk fruit will work. How many servings/slices would you say there is in the roll? Hi Erica, it’s in the recipe card. The cake makes 6 big slices. What are the measurements of the baking pan you use? It’s just a normal sized sheet pan. Like 41cmx30cm. I just watched a baking show on Netflix and they were doing a roll with sponge. She said you have to roll it while it’s still warm or it will crack. Go figure. Maybe try again and do it that way ? Hi Brandi, I did 🙁 I always let them cooled rolled up. The problem is when you open it up, it cracks everywhere once cooled when using erythritol. Can this be made with any other flour? We also have a nut allergy in the family. Sunflower seed flour is usually a 1-1 replacement for almond flour, but I haven’t tried personally. Can I not use whey protein isolate ? I made this! And I served it to my guests for Xmas with some whipped cream on it!